Is there a dark swan event ahead for the American economy? Summary: Europe is slowing fast. Asia may be slowing. Both trends are closely watched. But despite its fantastic fiscal and monetary stimulus, there are tentative signs that the US is slowing. Here we look at one expert team’s forecast of a recession. If they’re right we’d enter this recession with a 7% fiscal deficit and high unemployment. It would be a black swan event, with the government having few tools to mitigate it. Here are three reports from the Economic Cycle Research Institute, a well-respected independent shop. They publish the Weekly Leading Indicators, one of the three best-known leading indicators (the other two are by the OECD and Conference Board; see The Economist for details). 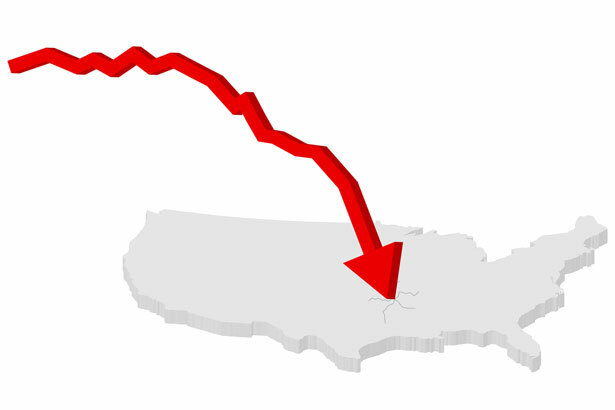 They expect a US recession in mid-2012. … Why should ECRI’s recession call be heeded? Perhaps because, as The Economist has noted, we’ve correctly called three recessions without any false alarms in-between. In contrast, most of those who’ve accurately predicted a recession or two have also been guilty of crying wolf – in 2010, 2005, 2003, 1998, 1995, or 1987. … It’s important to understand that recession doesn’t mean a bad economy – we’ve had that for years now. It means an economy that keeps worsening, because it’s locked into a vicious cycle. It means that the jobless rate, already above 9%, will go much higher, and the federal budget deficit, already above a trillion dollars, will soar. Our year almost without a winter gave the US economy a boost. Then seasonal adjustments, adjusting for the missing winter, made the good economic data look even better. Now we’re past that and the economy again shows signs of weakening. Worse, the global picture has darkened. Asia has began to slow; Europe teeters on the edge of recession. Will we have mutual re-enforcing weakness? After fours years of weakness, Europe and America are ill-prepared for recession. Has personal income growth ever remained this low for 3 months without the economy going into recession? The answer is no. The chart depicts real personal income growth over the last 60 years, with vertical shaded bands representing recessions, and the horizontal black line marking its latest reading. Except for three one-month dips, income growth has not been nearly this weak in 60 years without a recession – and certainly never for 3 months in a row. … As students of the business cycle, we admit to being hopelessly biased in our belief that it is simply not possible to repeal recessions in market economies. It is not whether there will be a recession, but when. And ECRI’s indicators are telling us that a recession is likely to begin by mid-year, if not sooner, though this may not become obvious until the end of the year. Four of the past six recessions started during a quarter when GDP was growing, as did 72% of all recessions in the past 94 years. How can that be? The answer is that expansions end — and recessions begin — at the peak of the business cycle, after which the economy begins to contract. For instance, the initial quarter of the Great Recession of 2007-09 showed 1.7% GDP growth, while the severe 1973-75 and 1981-82 recessions began with 3.9% and 4.9% GDP growth, respectively. Revisions are another issue, so GDP could be contracting and we wouldn’t know it for some time. That’s why real-time data often doesn’t show GDP turning negative until about half a year after the recession has actually begun – that’s typically been the case in the past six recessions. It took more than a year to learn that GDP actually shrank by 1.3% during the first quarter of the 2001 recession. But back then, it was initially reported as having grown at 2.0%. That’s not very different from the latest reading for GDP growth in the first quarter of 2012: 2.2%. In August 2008 – just before the Lehman collapse – GDP was reported to have risen in the first and second quarters with the latter revised up sharply, triggering over a 200-point rally in the Dow that day. Today we know that GDP actually shrank in the first quarter while the second has been revised down by two full percentage points. Do we have a shortage of workers, or just cheap employers? Part one. Part two. Next Post Are America and China secret twins? The similarities are striking, but we don’t see them. Source: “Roubini: EU To Break Up Once Contagion Hits Italy And Spain“, Forbes, 9 May 2012. It seems he expects most of the near-term turmoil in Europe and not in Asia/America. Roubini stays close to the consensus forecast. That’s natural. Everybody is looking at the same data, running more-or-less the same formula. The ECRI is far outside the consensus. I agree, but would it be a black swan? A crash would certainly be no surprise. Overextended overseas, corrupt, bloated and fiscally incontinent at home… We are ripe for one hell of a crash. It would be a black swan, as a recession lies far outside the current range of expert forecasts. There are always non-experts expecting a crash. Even in the best of times the perma-bears and doomsters warn that the end is near. That’s the kind of description that can describe a state for a century or more (eg, Rome). It’s irrelevant to short-term economic cycles like recessions or financial crashes — which can occur even in strong nations during long expansions (eg, the UK and USA during the late 19th century). With the EU’s troubles, China’s apparent problems, and the ongoing gutting of public services here, it’d be a kind of “black swan” if we **didn’t** see something like that. You guys have said yourselves that the anemic “recovery” we’re supposedly in is a very modest return for money spent…. I don’t believe you’re clear on the definition of a black swan: an unexpected events of large magnitude. It does not matter if we’re talking about super-scientists, ignorant crowds, or fortune tellers. All that matters is that they don’t expect the event. Accurate forecasting of inflection points and over multi-year horizons is beyond the current state of the art. These forecasts are better than guessing, however. None of those collectively are of sufficient size to induce a recession. the first two are small, as total exports are 11-13% of GDP (with Canada and Latin America our major partners). The large cyclical factors in the US are household consumption and private investment (broadly defined to include home construction and business capex). Oops. Bad proofreading. I was going to say that economic forecasting seems to be a kind of almost naive extrapolation of historical data. How far back does that data — good data — really extend? A couple of centuries? Maybe only one? Maybe only a handful of decades? There are many reasons accurate forecasting is beyond the state of the art. You mention one: short data series. The great National Income Production Accounts were developed in the 1930s, and are the foundation for econometric work. Good employment surveys began in the early 1940s (those 1930s jobs numbers are rough estimaates). Even today much key data is rough; worse, its often collected with long lags — making it of limited or no use for forecasting. Two, economic theory remains primative. Three, technological and social changes make models obsolete. Imagine if E no longer equaled MC2. Women enter the labor force, kids study longer, people get access to disability income. Agriculture employment goes from 90% to 5%. Ditto manufacturing, and perhaps during the 21st century that happens to services. The factors of production become globally mobile (their imobility was an assumption of Richardo’s reason for free trade). What you’re talking about here is mostly conventional negativity. The Black Swan is by definition the thing that comes out of the blue. We can’t anticipate it, because if we did, then it wouldn’t be a black swan. The $2B JP Morgan loss is closer to the feel of it — not in the scale, but where it occurs, and how it occurs — someone at one of the TBTF’s, pushes the wrong button, makes a bad bet, and it’s like the $2B loss, except it’s scary huge and devastating in a way that downs a major bank and threatens everyone with connections to that bank. Right now, the situation with Greece and the EU, is unpredictable — and possibly very bad. Who knows what kind of bets have been made by the big US banks. Another possibility is massive fraud or bad accounting. MF Global has proven that the books can just be a mess and nobody really knows until after the crash These things might be unlikely, but, then, again, that’s the whole point of the black swan. That it’s the unlikely event that we don’t prepare for that causes systemic destruction. None of that is reallyy correct. No. A black swan event, as usually defined, results from the range of forecasts. It has nothing to do with the degree to which the event can be accurately predicted. No. There have many experts predicting that one of the 3 top deriviative dealers (JPM being the largest by far) would have a large loss (and even more that someone trading these would, as did AIG). Basis mis-match (the most common guess as to its nature) is a common problem. We’re talking about a US recession. Europe’s swings do not necessarily have a large effect on the US, unless VERY large. We’re talking about a US recession. Bank losses from Europe’s events have little chance of affecting the US economy (JPM’s from this were minon in terms of its profibability, let alone its solvency). Commodity brokers go broke frequently. This has nil effects on the overall US economy. They are very likely, not black swans at all. See #5 and 6. JPM’s loss is only #7 in terms of largest trading losses, and far further down in terms of percent of firm capital lost. I doubt you can support that statement. The things that cause systemic (ie, large-scale) are wars (foreign and domestic), massive natural events (eg, droughts), and deep economic downturns. All of these are commonplaces, to which we prepare more or less adequately. We might not have wars if we didn’t prepare so well for them. It’s almost as though the congress and the Fed, in trying to reignite demand, created the TARP and then lowered rates, but the only effect was to damage the Fed’s own balance sheet by buying impaired assets for full retail and lending reserves at near zero rate to questionable institutions who are using the money to gamble. I now expect the Fed to plead with congress to greatly increase fiscal deficits because the Fed has “Done all it can do”. The Fed also has exposure to Europe through the swap lines it’s been extending to tottering Euro-banks. As you have noted, hyperinflation is a fiscal phenomenon and we are approaching an early decision point on that road in the congress in an election year. What could go wrong? No. Conditions in Q4 of 2008 and Q1 of 2009 were similar to 1929, as several studies have shown. Unlike 1929, fast fiscal and monetary policy responses prevented the deflationary spiral. It’s daft that people looking at the medicine’s success and say it had no effect. No, we’re years from such a decision. In a downturn there is a large demand for safe assets (aka Treasury securities, bank deposits), so large deficits can be financed at low rates. The low rates prove that (including interest rates on long bonds over which the Fed has little influence). Also, the Federal government’s public debt is aprox $11 trillion (70% of GDP), far below the 100% “yellow zone” at which developed nations’ debt levels become of concern. Also note that our budget problems are of a far easier type than those of other nations. First, our dysfunctional health care system massively inflates the deficit, yet most of our peers have systems that produce equivalent (or better) results at half the cost. Second, we spend almost $1 trillion for defense and foreign intelligence (broadly defined) — roughly 2x what our peeers spend (also without the fear attacks that afflict America). Both of those are easy fixes, in the sense of known solutions, and could reduce the secular deficit (ie, long-term, non-recession) to a low and manageable level. I like Ed Harrison’s analysis that long rates are just the market’s best guess of what the sequence of short rates out to the long term will look like. The Fed controls short rates and has “promised” to stay the course out to 2014 at least. This IMO is why long rates are staying down. At some point, savers realize that they have (literally) nothing to gain by interest payments and lots to lose if the central bank goes bust. At this point, lenders are long gone and then the central bank is trapped with ZIRP and lender of last resort status. We are getting close to this IMO. Witness bank runs in Greece now, and recall events in Argentina a decade ago. This willingness by our central bank to wreck its own balance sheet is the under-reported story of our times IMO. We are I agree, years from such a (hyperinflation) decision, but the first baby steps in that direction are the hardest to retrace politically even if it works. It’s hard to know what to do. There is very little margin for error. You have noted that how the deficits get spent is an important variable. What worries me is that black swan events are by definition outliers far from the statistical mean. Taleb pointed out in his book that these kinds of events get judged as astronomically unlikely because “experts” think that we’re living in a statistical universe with a Gaussian distribution where these kinds of black swan events only occur so far out on the tails of the distribution that you wouldn’t see that kind of even more than once every million years or so. But Taleb points out that the statistical distribution of incomes or stock price swings in the real world isn’t anywhere close to a Gaussian (normal) distribution. The tails are much fatter in the real world, so events that would qualify as impossibly unlikely in theory tend to happen uncomfortably often in the real world. For example, if incomes in America had a Gaussian distribution, you wouldn’t expect to see more than a handful of billionaires, but America has 403 billionaires in 2012. Taleb calls the statistical universe of the real economy “extremistan,” a place where extreme events occur much more often than ordinary experience would lead us to expect. This is worrisome because extremely rare outlying events also tend to be huge. There’s a 1/f distribution at work there connecting the magnitude and the frequency. The rarer the event, the more intense: we see this with earthquakes, for example. This suggests that since the probability of another economic downturn this year (so close to the last massive downturn) is very unlikely according to conventional economic theory, if we do get a downturn, it might be huge. If we do get a massive downturn and unemployment skyrockets just before the presidential elections this year, that could spell very serious trouble for Obama. If we get a president Romney + a Republican house and senate + far-right activist Supreme court, batten down the hatches. Describing an event as “unpredictable” is vague, as the word has several meanings. This definition focuses on the psychology about the event: we don’t expect it. Perhaps rightly so — if our knowledge, experience, and theory suggest a low likelihood. Not so; many kinds of events do not have a 1/m distribution. For example, there are many poker hands as rare as a Royal Straight, but occur without notice. We are aware of unusual AND large events, and don’t notice unusual events that have little impact. Agreed. Obama would be toast. For me Taleb is describing a mechanism by which preposterously wrong estimates of probabilities can result from specific cognitive failures exemplified by his Black Swan parable. If I ask “What is the probability that every one on earth will die on the same day”? You might take all the bell curve distributions describing causes of death and multiplying to get the answer. No doubt this would be a number so small it rivals the chance all the air will leave this room as I Type. But the model excludes the chance of a meteor strike that liquifies the whole planet. This is a black swan, a systemic factor low in probability that, if excluded from consideration causes a preposterous and wrong low estimate of probability.